Nanobiosensors have been successful for in vitro as well as in vivo detection of several biomolecules and it is expected that this technology will revolutionize point-of-care and personalized diagnostics, and will be extremely applicable for early disease detection and therapeutic applications. This book describes the emerging nanobiosensor technologies which are geared towards onsite clinical applications and those which can be used as a personalised diagnostic device. Biosensor technologies and materials covered include electrochemical biosensors; implantable microbiosensors; microfluidic technology; surface plasmon resonance-based technologies; optical and fibre-optic sensors; lateral flow biosensors; lab on a chip; nanomaterials based (graphene, nanoparticles, nanocomposites, and other carbon nanomaterial) sensors; metallic nanobiosensors; wearable and doppler-based non-contact vital signs biosensors; and technologies for smartphone based disease diagnosis. 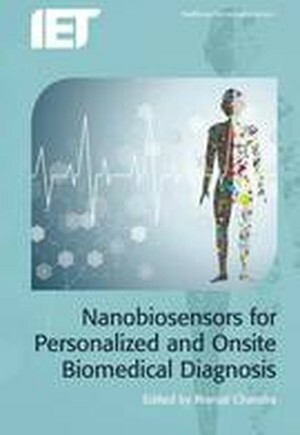 Clinical applications of these technologies covered in this book include detection of various protein biomarkers, small molecules, cancer and bacterial cells; detection of foodborne pathogens; generation and optimisation of antibodies for biosensor applications; microRNAs and their applications in diagnosis for osteoarthritis; detection of circulating tumor cells; online heartbeat monitoring; analysis of drugs in body fluids; sensing of nucleic acids; and monitoring oxidative stress.